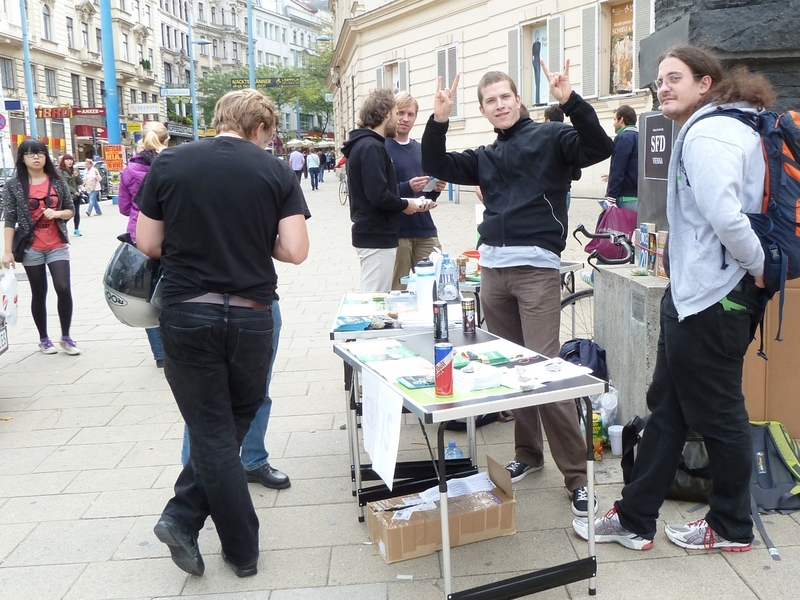 On Saturday 15th September the FSFE fellowship group Vienna held an information booth in Vienna’s most prominent shopping street. We began at about 10am and finished at 6pm. Although we had planned to stay until 7pm, we couldn’t because we had given out all our materials. 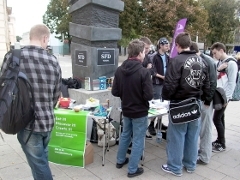 In the end we even used the leaflets we glued to the table at the beginning of the day because people still wanted more. 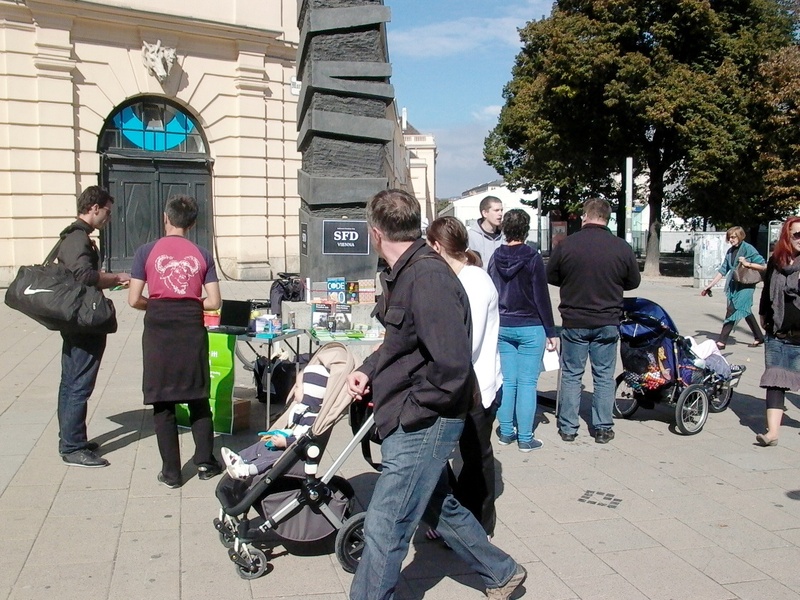 We distributed over 300 Live-CDs with free operating systems and about 1000 leaflets. Most people had never heard of free software before, but were easily convinced of the virtues of free software mainly concerning independence from big corporations and governments. 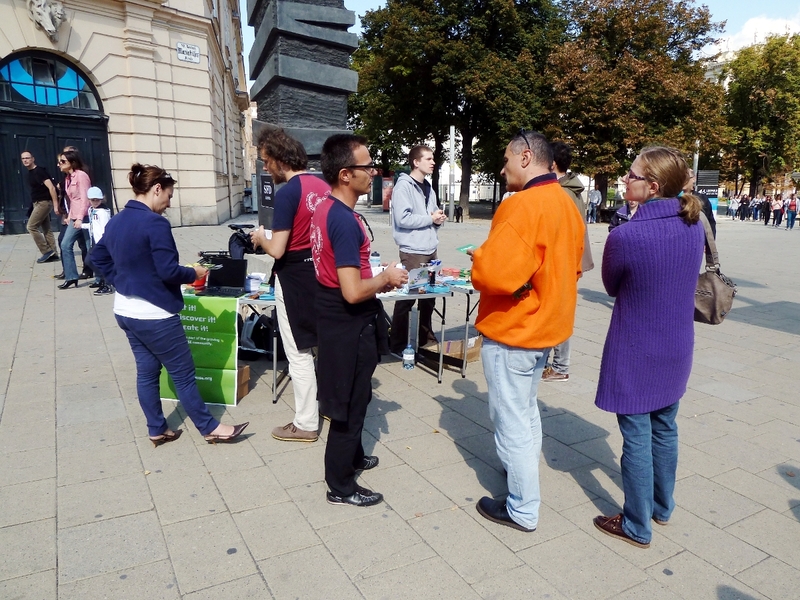 Many wanted to take a free sample of our operating system CDs right away. 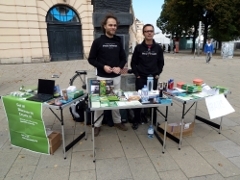 We had official openSuse, and our own FSFE fellowship edition of Ubuntu, Debian and Trisquel CDs. We did our best to match the knowledge that people had to the appropriate software for them because it is clear that less advanced computer users might have difficulties dealing with missing proprietary drivers when using Trisquel for example. 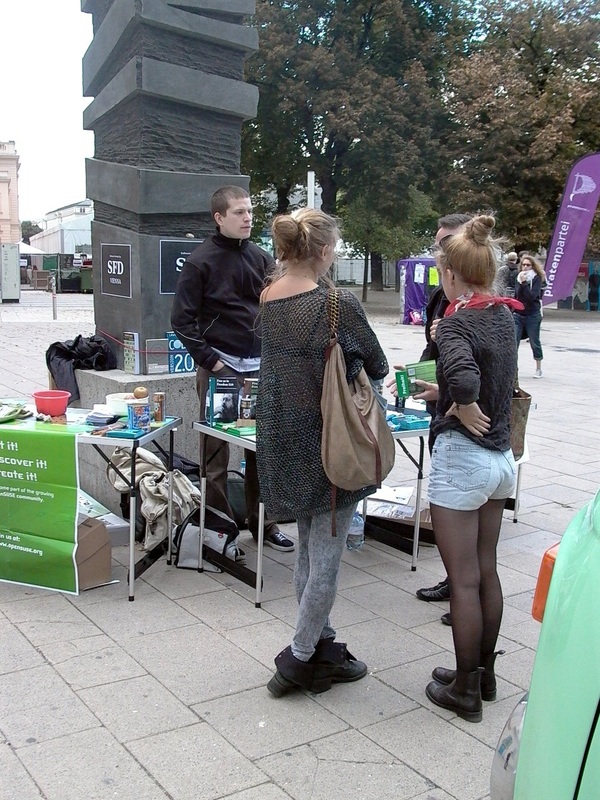 Because we didn’t have any equipment for an open air booth before, we organised inexpensive tables, pieces of wood, some screws and hinges from a nearby DIY market and built our own poster panel. Most of us don’t own cars and we store all material in our private flats. Therefore, we tried to keep the equipment small, light and durable – especially for carrying all of it by subway and/or bicycle. In order to clarify what we stand for, we accepted an offer from a young local free software enthusiast, who owns a small textil printing shop: For a very low price he printed our slogan: Independent through free software – fsfe.org on black organic fair trade hoodies. 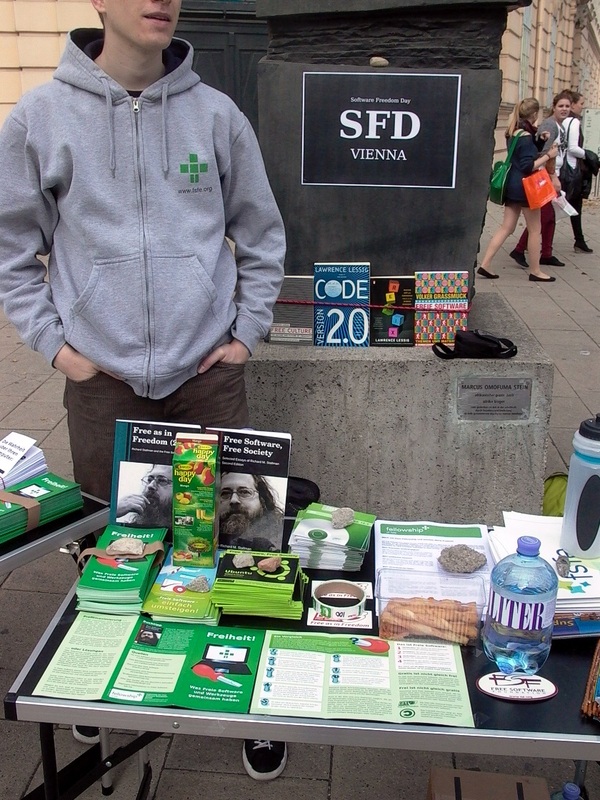 On SFD in Vienna we sometimes had dark clouds and for very short periods even light showers, but over all the weather was quite pleasant and we (and our material) didn’t get really wet. 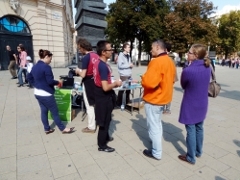 We brought a pile of our private copies of very good books featuring free software and free culture for display, but didn’t get into any discussions about it. In the end we didn’t even use our notebook computers that we had taken with us in order to show how our offered software looks and works because passers by didn’t need this kind of detail. 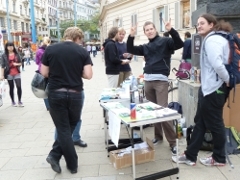 After disassembling our booth most of us celebrated the Software Freedom Day in an excellent nearby vegetarian restaurant. Thanks to the generous support of many local fellows and other friends involved in preparing and carrying out this event we can honestly say it was a great success. 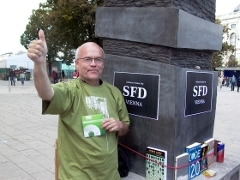 This entry was posted on Monday, September 17th, 2012 at 22:01	and is filed under English, Event. You can follow any responses to this entry through the RSS 2.0 feed. You can leave a response, or trackback from your own site.